Life in a Jar is my blog about my experiences fermenting and pickling, my interests and thoughts, Music, books, sayings, pics, etc. The story of sauerkraut is really the history of the cultivation and spread of cabbage. Evidence seems to indicate that cabbage began in the Mediterranean. To be sure, the Romans ate cabbage. The word “salad” comes from “Sal”, which means salt. Romans were fond of putting salt on their raw greens…salted greens? Sounds like sauerkraut to me! However, I’m going to start with China, where cabbage has been cultivated for about 4,000 years. 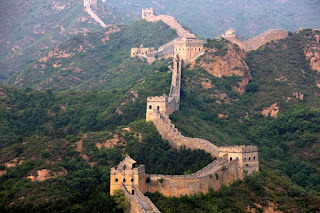 When the Great Wall of China was being built, some 2,000 years ago, the laborers were fed cabbage fermented in rice wine. Work on the Wall was certainly arduous, and many of the locations were remote. A food supply was needed that would keep and travel well. When Genghis Khan invaded China about 1,000 years later, he adopted this fermented cabbage, added salt, and was so happy with it, that he gave it to his army to spread the good news about this nutritious and tasty food. 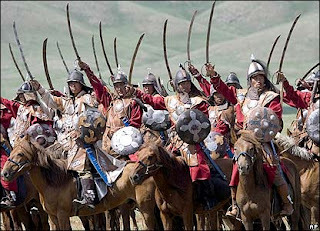 The Mongols invaded a huge chunk of Asia and parts of Eastern Europe. Sauerkraut gave the soldiers a “sour” attitude and they were famous for both their speed and rapaciousness. From the parts of Europe that the Mongols invaded, the Jews as they migrated are credited with spreading sauerkraut making throughout Europe and Russia. In Europe, especially in colder climates, cabbage was a popular crop. It was easy to cultivate, thrived in cooler climates, and it kept well in winter. Cabbage was a staple for many farmers, and continues to be one today. Making the cabbage into sauerkraut made it more nutritious and last longer, crucial for surviving the cold harsh winters of Russia and Eastern Europe. I should note that although Jews are noted for sauerkraut and pickles, I’m not at all certain that they got the knowledge from the Mongols, nor am I certain that the Germans or Russians got it from the Jews. There certainly seems to be a connection, so I don’t discount it, and it makes a good story. Cabbage, salt, and a container are all that is required, and salt has been used as a food preservative for tens of thousands of years. It's possible that the culturing of sauerkraut occurred spontaneously in several places, but it is certain that as these human cultures moved and interacted that they would have influenced each other and shared techniques, plants, recipes, etc. In the Americas, sauerkraut was brought by Germans, who became known as the Pennsylvania Dutch. The Pennsylvania Dutch and the Amish are still known for their krauts and pickles. Soon after came Jews with their excellent versions, and later came Eastern Europeans, also with their great versions. Who makes the best? Depends on who you talk to. Due to food rationing during the World Wars, sauerkraut was very important in the U.S. as a means of stretching food value. Of course, it wasn't called sauerkraut...it was called "Liberty Cabbage." 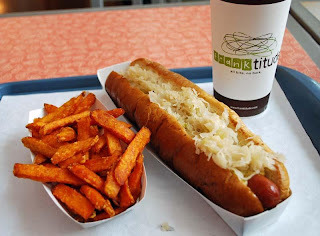 So, a "frankfurter with sauerkraut and french fries" would become the more patriotic "Liberty Dog with a side of Freedom!" All American Victory Victuals! Yum! The history of sauerkraut is a living history. It is a story of a relationship between people and plants, people and beneficial bacterial cultures, and between people and other people. In tracing sauerkraut from Ancient China to Europe and the Americas, I'm only touching on the tiniest fraction of this story. It is an amazing and personal story. Since most cultures have some sort of fermentation tradition, chances are that I am talking about YOU. Whether you are of European, Asian, or African descent, your parents most likely didn’t make sauerkraut or pickles, but your grandparents or great grandparents CERTAINLY did. If you go back a generation or two, you’ll find members of your family that made sauerkraut, pickles, yogurt, wine, etc. 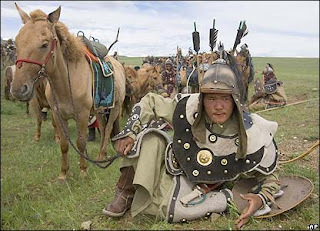 Our personal relationship with these cultures and history is intrinsic to human survival, but that is for another blog. My recipe for this week I’ve decided to call “Genghis Jim’s Mongolian Horde Kraut.” It’s inspired of my reading about sauerkraut being fed to laborers working on the Great Wall 2,000 years ago and Genghis Khan's later assault of that Wall and his invasion of China. I started out by trying cabbage in rice wine and mirin, which was a little soggy and flat. I then added some salt, which helped, but it still needed something. Even 2,000 years ago the Chinese had herbs and spices. Also, Genghis Khan would have had access to herbs and spices from throughout the world. This recipe is not meant to be an accurate representation of an ancient sauerkraut recipe, but rather is my tribute to a period of history. I have mostly tried to keep accurate to ingredients that would have been available, but I think Mr. Khan would have liked chili peppers if they were available. This is a spicy blend that will get you going and ready to scale whatever Great Wall lies in front of you. I invite you to try it and hope you enjoy! Salt to taste, about 2 tsp per head. Chop cabbage and put into a pot. Add salt and mix it with your hands thoroughly. Taste it—it should be salty. Let it sit and “sweat” while chopping the other veggies. Add the other vegetables and mix thoroughly. Then add spices, mixing and tasting it. Add the wine until you are satisfied with the blend of flavor. Pack tightly into canning jars as per my instructions in my previous post. Seal and leave it for a week or so to ferment. Sample occasionally until it’s fermented to your satisfaction. This should keep for several months unrefrigerated. Thank you for reading. Next week I’ll discuss sauerkraut and human culture and present another recipe or two. I think I would have got to the point of adding the wine and decided drinking said wine was even better than the kraut!.......nice history lesson and recipe! The Newbury Park Guy. A guy living near Los Angeles with his cat, Constant.